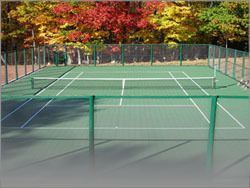 Supreme Sports of Chicago specializes in tennis court installations for the backyard or commercial space. We serve Chicago, IL and all nearby cities. 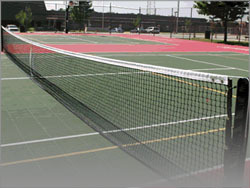 Playing on Supreme Sports's Chicago Tennis Courts is always convenient and safe due to our all-weather surface. Players of all ages and levels will enjoy this orthopedically sound design that promotes stress reduction and injury prevention. By incorporating key advancements in technology, we are committed to ensuring the health and safety of players everywhere. Our comfortable surface protects ankles, legs, joints, and lower backs from serious injury. Supreme Sports Tennis Courts deliver the ultimate game performance with unparalleled traction and a 25-30 year life expectancy that make it the best deal on the market today. Contact us today for a free estimate by a Supreme Sports Specialist near you.